As superintendent of the Denver Public Schools, Michael Bennet enacted a nationally recognized merit pay system for teachers and increased funding to the city’s early-education and full-day kindergarten programs. While serving as chief of staff to Denver Mayor John Hickenlooper, he helped close a 10 percent budget gap during his first two months in office and balanced two consecutive budgets, while preserving municipal services. After graduating from law school, where he was editor-in-chief of the Yale Law Journal, Bennet clerked for the U.S. Fourth Circuit Court of Appeals and later served as counsel to the deputy attorney general for President Bill Clinton. He then took a seven-year detour into what he describes as “a very happy period of time in the private sector.” When his wife, environmental attorney Susan Daggett, took a job with the Earth Justice Legal Defense Fund in Denver, Bennet went to work as director of the Anschutz Investment Company, also in the Mile-High City. During his seven-year stint at Anschutz, Bennet led the reorganization of four distressed companies, which required the restructuring of over $3 billion in debt, and managed the consolidation of three major movie chains into Regal Entertainment Group, the world’s largest film exhibitor. He returned to the public sector in 2003 to become chief of staff to Denver Mayor John Hickenlooper, a businessman and fellow Wesleyan University alumnus. Drawing on his own business background, Bennet succeeded in balancing a historic budget deficit, renegotiating several collective bargaining agreements, and stimulating job creation by working with struggling businesses in the private sector. As a child, Bennet enjoyed the advantages made possible by his own parents’ social and economic status. One of these was the opportunity to attend a private school, where he was diagnosed with dyslexia at an early age and received the help he needed to work through his learning difficulties. Bennet, selected in 2009 by Colorado Governor Bill Ritter to fill the U.S. Senate seat vacated by now-Secretary of the Interior Ken Salazar and re-elected in 2010, is also a strong supporter of immigration and healthcare reform and voted in favor of the Patient Protection and Affordable Care Act signed by President Obama in 2010. 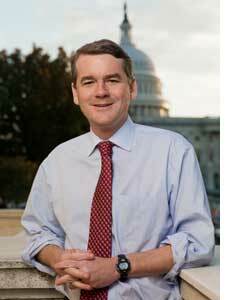 In recognition of his strong leadership skills and abilities, Bennet’s peers awarded him Ted Kennedy’s seat on the Senate Committee on Health, Education, Labor, and Pensions. Gejdenson served twenty years as a U.S. Congressman from Connecticut, four years as a member of the Connecticut House of Representatives, and one year in the administration of Governor Ella Grasso. Gejdenson advises clients on international business issues through his company, Sam Gejdenson International.